Andy Weir’s first novel is a smash hit, and is now being filmed–deservedly so. It has the simplest plot imaginable: the struggle for survival in a uniquely hostile environment, while repeatedly putting the central character through sheer hell in pursuit of that goal. But the plot works well, given that the novel’s interest lies in the central character and in the means he uses to survive. The Martian has three major strengths. One is the narrative voice of the primary character, Matt Watley, a mechanical engineer/botanist astronaut stranded alone on the surface of Mars. Watley comes across as humorous, non-self-pitying, and resourceful–a likable character it’s easy to root for. A second strength is the description and explanation of the many ingenious technical means Watley uses to survive. To say that Weir did his homework here would be understatement. A third strength is Weir’s writing. It’s lively and concise, and that’s due, at least in part, to Weir’s use of active voice throughout, and his avoidance of flowery prose. He didn’t write a single sentence in passive voice (at least that I noticed), he uses adjectives very sparingly, and he might not have used a single adverb in the entire book–again, I didn’t notice any. And the alternation of first-person narrative by Watley and third-person narrative in the sections concerning the NASA hierarchy and the spacecraft (Hermes) crew that inadvertently abandoned him provides welcome contrast. The weaknesses in the book are minor: several of the recurring NASA characters are little more than names attached to functions, and it’s not always clear what those functions are. Early in the book, Watley mentions those characters’ jobs when he introduces them, but it’s all too easy to forget what their jobs are. (In contrast, the characters populating the Hermes are well sketched out.) Only two NASA characters are easy to recall. One plays against type, Annie Montrose, NASA’s incredibly foul mouthed (in private) spokeswoman. Another more minor character, Richard Purnell, plays to type as a brilliant nerd who’s painfully socially awkward. Some of the sections featuring these two characters are quite funny, as are many of the sections narrated by Watley. 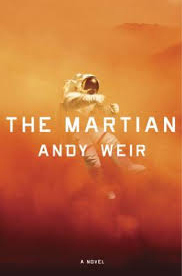 In sum, The Martian is the best hard sci-fi novel in ages. I can’t wait to see what Weir will do for an encore. Highly recommended. Zeke Teflon is the author of Free Radicals: A Novel of Utopia and Dystopia (pdf sample here). He’s currently working on the sequel.